The travel industry’s most pioneering airports and airlines were last night recognised for their outstanding efforts to improve the passenger experience at the 5th Future Travel Experience Awards ceremony, which took place at Future Travel Experience Global 2015. The FTE Awards ceremony was held at the Mandalay Bay Resort Las Vegas, where more than 600 senior travel industry figures from airlines, airports, government agencies, vendors and a variety of other travel industry stakeholders have gathered to reveal their passenger-focused plans, discuss their future visions and launch their latest products and services designed to improve the end-to-end passenger experience. 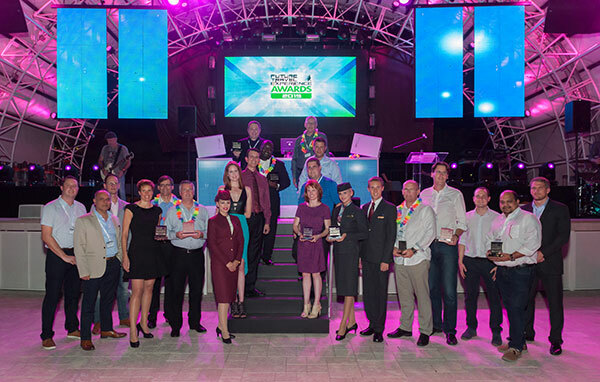 The revolutionary Aruba Happy Flow project, which went live in May 2015, was awarded the “Best Immigration & Arrivals” initiative. Happy Flow ­– a collaborative project driven by the governments of Aruba and the Netherlands, Schiphol Group, KLM, Aruba Airport Authority and lead contractor Vision-Box – uses facial recognition technology as the basis for a single passenger token, and removes the need for passengers to present their passport and boarding pass at multiple stages of the journey. The process is currently in place for KLM flights between Aruba and Amsterdam. When a passenger checks in at a self-service kiosk their photo is taken, which is then verified against, and linked with, their electronic passport, while at the same time the border control background checks are performed. Once these immigration checks are automatically undertaken, all of the airport stakeholders receive the information. For instance, the immigration agency receives the information when the passenger checks in, so they know that they will soon be entering the immigration checkpoint. The long-term goal of Happy Flow is to create a wider European preclearance programme, which would pave the way for a transformation in the way passengers are processed in airports around the world.